She was also an entrepreneur, an influential advocate for Māori, and an author, producing the first extensive published ethnographic work by a Māori scholar. Born Margaret Pattison Thom at Matatā in the Bay of Plenty to an English father, William Thom and a Māori mother, Pia Ngarotū Te Rihi, a high-born Te Arawa woman of Ngāti Wāhiao hapū of Tūhourangi. Mākereti gained a thorough education in both cultures, and was comfortable moving between the two. After leaving school, she lived at Whakarewarewa, the ancestral home of her people, and she became a guide, renowned for her wit, eloquence, and charm. Her natural leadership qualities earned respect. An advocate for Māori self-determination she worked on promoting aspects of Māori culture to gain economic benefits for her community. 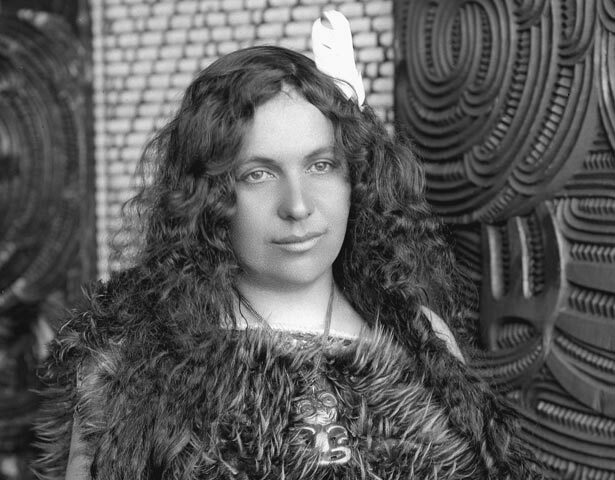 She wrote a book, Guide to the hot lakes district (1905), and formed a touring Māori concert party. In 1911 she took a 40-strong concert party to Sydney, then England. The show was popular with audiences and received excellent publicity, but was beset by financial and other problems. One party member died during the tour, and many others decided to stay in England. When the remains of the group returned to New Zealand in 1912, the Whakarewarewa people were upset, and Mākereti was largely blamed. In England she had become engaged to a wealthy landowner. She returned and married. After divorce in 1924, Mākereti enrolled at Oxford University. She used her collected notes and journals to write an anthropology thesis – an account and analysis of the customs of Te Arawa iwi (tribe). In April 1930 she died suddenly. Her thesis, The old-time Maori, was published eight years later, and reprinted in 1986. We have 3 biographies, related to Mākereti Papakura.